The 1866 James Monroe House, the 1836 Little Red Schoolhouse and the 1884 Jewett House will host free "open houses" and invite visitors to learn more about the history of Oberlin and its early residents through "at your own pace" mini tours. The Heritage Center's 2009 class of Junior Docents, teens who just completed a week-long summer camp/docent training workshop, will be on hand helping throughout the day - come meet them and be awed by their knowledge and enthusiasm! Those with more time and interest can join a more extensive docent-guided tour that will be offered at 10:30 a.m. and again at 1:30 p.m. Guided tours also will be free today because of the Fun Fair (a savings of $6 per person! ); space is limited, however, and is available on a first-come, first-served basis. Adding to the festive atmosphere will be tunes flowing from a busker's organ, hand-built and played by Oberlin Heritage Center member and volunteer, Bill Cutcher. A busker is a street entertainer. Organ grinders were commonly found busking in the old days. You'll enjoy hearing the organ music and finding out more about how it is played. You may also want to look for the Oral History table where residents and visitors can record their memories of the Apollo Theatre and other favorite Oberlin places and events in years gone by. Drop in at the Schoolhouse to experience historic school lessons and play old-fashioned games in the oneroom schoolhouse. Stilts, hoops, bean bag toss, sack races, and more will be available in the schoolyard all day long, weather permitting. All Heritage Center activities are free and open to the public during the Family Fun Fair festivities. 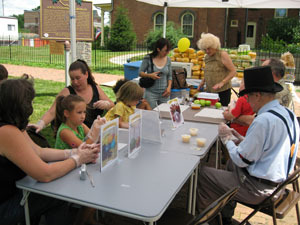 While visiting the Heritage Center grounds, make sure to stop by the "Jupies Old-Fashioned Sorghum Taffy Pull" tent and try your hand making an old-fashioned sweet treat. Kids and adults can pull taffy and cover an apple for $2. There also will be free popcorn samples from Campbell's Popcorn in the West Side Market. Their "Dichotomy popcorn" was listed as "Best of Cleveland" in 2007. For more about the Heritage Center's Family Fun Fair activities, call 440-774-1700 or e-mail tourinfo@oberlinheritage.org . For a full schedule of Family Fun Fair events throughout Oberlin, visit www.mainstreetoberlin.org or contact Main Street Oberlin at 440-774-6262 or email oberlinmainst@oberlin.net .